Newton South High senior William Rhatigan cruised to his fourth straight Mass. Bay ski win Tuesday afternoon at the Weston Ski Track. WESTON – When Newton South High senior William Rhatigan sailed across the finish line at the Weston Ski Track on Tuesday afternoon, he was dressed more appropriately for a day at the beach than a trek on a Nordic trail. Rhatigan was donning black shorts and a black cut-off tank top as he trudged around the snow-covered fairways of the Leo J. Martin golf course. Unusually warm temperatures that were hovering close to 50 degrees allowed him to leave his traditional ski apparel at home. “Usually I’ll wear some ski tights, ski pants and a long sleeve shirt and jacket. But it’s 50 degrees out. If I wasn’t skiing and it was 50 degrees out I’d be wearing a t-shirt and shorts, so why not?” said Rhatigan, who finished first in Tuesday’s Mass. Bay East boys race with a time of 13 minutes, 30 seconds. 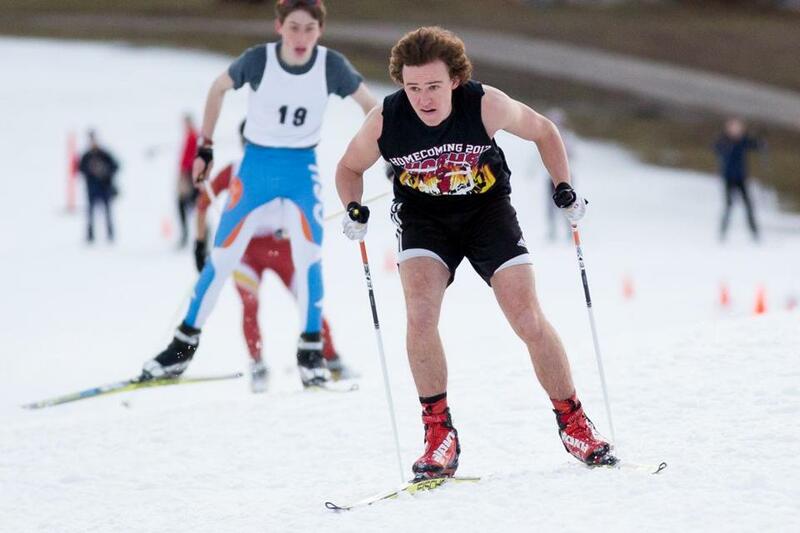 Such wardrobe choices were common on Tuesday afternoon and have been for the duration of what has been the most uncommon of high school ski seasons. A lack of snow and unseasonably warm temperatures have left local high schools scrambling to find facilities to hold practices and meets. The Weston Ski Track, which produces artificial snow when conditions allow, is currently the only facility in the region available for cross-country skiing. Both Mass. Bay West and Mass. Bay East, which in total include 12 teams, have had to share the track at Weston, limiting the amount of time for workouts and practices. “It’s really been something else,” said Concord-Carlisle’s Tyler Lee, who won Tuesday’s Mass. Bay West boys race with a time of 13 minutes, 58 seconds. “It really poses a lot of challenges . . . and all the high school teams really deserve an equal chance at getting on snow, but there’s only a finite amount of snow that we have. Lincoln-Sudbury coach Graham Taylor, who has guided the Warriors since 1982, could not recall a more taxing high school season regarding a lack of snow. “This is turning out to be, in my experience since I’ve been involved with the L-S team, the worst winter so far for natural snow,” said Taylor. Teams were not able to hold races until early January because of record warmth throughout December. After Tuesday’s race, teams finally have four races completed, the amount the MIAA requires to be eligible for the Mass. State Championship, which is currently scheduled for Thursday, Feb. 11 at Notchview Reservation in Windsor. Those challenges are in stark contrast to last winter, when a historic snow blitz produced a winter wonderland for ski teams across the state. “Last year, we could ski until April,” said Acton-Boxborough Regional senior Chantal Raguin, who won Tuesday’s Mass. Bay West girls’ race in 16 minutes, 42 seconds. Having to rely on artificial snow also limits the amount of track that is available at Weston. (On Tuesday afternoon, there were golfers out enjoying some of the snowless fairways) Currently, there are just 1.2 of a possible 15 kilometers open for skiing, a number that will continue to dwindle until temperatures drop enough to support artificial snow making. Despite the space limitations and the dependance on artificial snow — which most skiers say is much slower and tougher than the real stuff — the schools are thankful for the opportunity that the Weston Ski Track affords. “It’s really nice that Weston is able to provide man-made snow to give us this opportunity to race, to train, and to ski, even when you have these 55 degree days in the middle of January,” said Lee. The warmer temperatures also pose a challenge for racers, who have to be more cognizant of the way they dress to prevent overheating. Though most skiers on Tuesday elected to bundle up a bit more than Rhatigan, heavy jackets, winter hats, and ski masks were nowhere to be found. “Most winters you don’t notice that you’re sweating,” said Lee, who said his ideal skiing temperatures are in the low-to-mid 20s. And while many New Englanders are just fine with February temperatures in the 50s after last year’s record-setting winter smack down, the region’s ski community is getting antsy. With much of the remaining high school schedule in question, coaches and skiers are constantly training their eyes to weather forecasts, hoping to see snowflakes and colder air in the future. Weather permitting, the Nordic state meet is scheduled for Thursday at Notchview Reservation in Windsor. These skiers have made their mark this season. ■ Jordan Fried, Brookline: After placing fourth at last year’s state meet, this senior has not finished lower than third in any of the four Mass. Bay East races this season. ■ Jacob Jampel, Newton North: Just a sophomore, he has been the runner-up in three of four Mass. Bay East races this season; he was ninth at last winter’s state meet. ■ Chantal Raguin, Acton-Boxboro: The junior won the Mass. Bay West race at the Weston Ski Track on Tuesday in 16 minutes, 42 seconds. ■ Ella Redmond, Wellesley: She has recorded one win, two runner-up finishes, and a third in four Mass. Bay West races this season. ■ William Rhatigan, Newton South: The senior has won all four Mass. Bay East races this season by at least eight seconds, capturing the latest in 13 minutes, 30 seconds. ■ Gabby Vandendries, Brookline: After her runner-up finish at last year’s MIAA state meet, the junior has won two Mass. Bay East races this season. Eric Russo can be reached at eric.russo@globe.com.